USS NEREUS was the fifth FULTON - class submarine tender and the third ship in the Navy to bear the name. In Greek mythology, Nereus is the god of the sea represented as a kind and wise old man who was the eldest son of Pontus and Gaea and the father of fifty mermaids, the nereids. 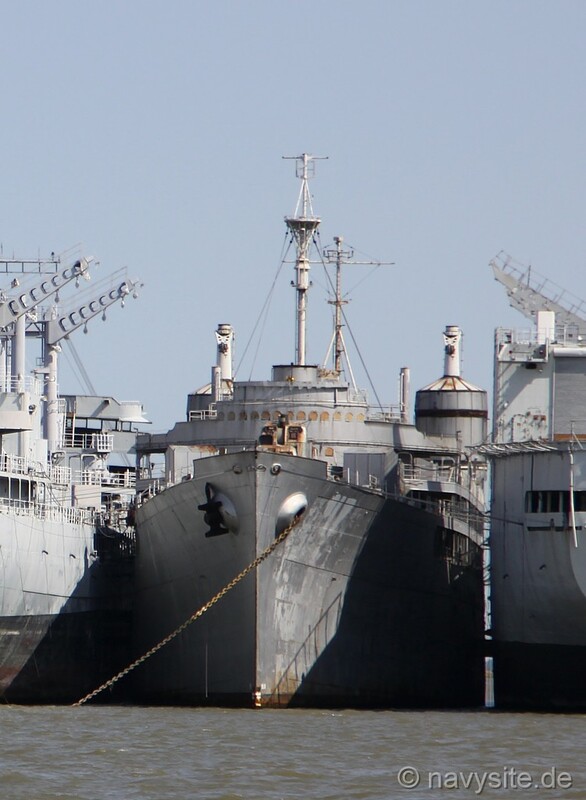 Decommissioned in 1971, the NEREUS is since then laid up in the National Defense Reserve Fleet at Suisun Bay, Benicia, Calif. This section contains the names of sailors who served aboard USS NEREUS. It is no official listing but contains the names of sailors who submitted their information. Click here to see which USS NEREUS memorabilia are currently for sale on ebay. October 9, 1963 off San Diego, Calif.
USS CALIENTE (AO 53) and the USS NEREUS collide off San Diego, Calif., during refueling exercises. Both ships are damaged. 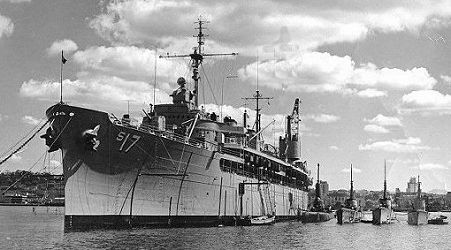 USS NEREUS was laid down 11 October 1943 by U.S. Naval Shipyard, Mare Island, Vallejo, Calif.; launched 12 February 1945; sponsored by Mrs. A. M. Hurst; and commissioned 27 October 1945, Captain L. D. Follmer in command. Submarine tenders enabled the Navy to move into a conquered island and in a matter of a day or so have a submarine base in full commission, able to service and repair any submarines regardless of its type or special equipment. At island bases in World War II, submarine tenders worked indefatigably to keep the submarine at sea and on the firing line. After shakedown in the fall of 1945, the new submarine tender departed 15 December for Japan. Arriving Sasebo early in 1946, she stripped 39 Japanese submarines of all usable equipment and material before towing them to sea and sinking them with her guns in Operation “Roads End” 1 and 2 April. Soon underway for home, she arrived San Diego 13 May for a year of submarine service and repair work. On 28 June 1947, she got underway for Operation “Blue Nose.” This cruise was entirely novel for a submarine tender. Together with the submarines BOARFISH (SS 327), CAIMAN (SS 323), and CABEZON (SS 334), NEREUS was assigned to TG 17.3. On 15 July she left for the Aleutian Islands where Rear Admiral Alan 11. McCann, Commander Submarine Force Pacific came aboard. The group was underway again 25 July, this time for the Pribiloff Islands. During this transit Army Air Force planes based at Adak took part in the antisubmarine training. On 30 July NEREUS passed through the Bering Strait and crossed the Arctic Circle. Following along the International Date Line, the ships of Operation “Blue Nose” sighted pack ice on the morning of 1 August 1947. After reaching 72’15’ north latitude, the ships continued independently along the ice pack to determine its shape. Before returning to her home port of San Diego, NEREUS visited Norton Bay, Kodiak, Juneau, and Vancouver, B.C. The cruise was followed by the ship’s first overhaul, at Mare Island. 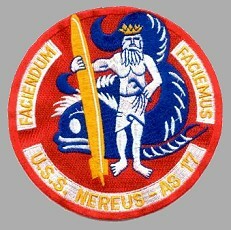 Since 1948, NEREUS has been primarily engaged in submarine repair and services at San Diego, Calif. During these two decades of faithful service keeping the Navy’s submarines at peak fighting trim, NEREUS made occasional cruises to Pearl Harbor; to Acapulco, Mexico; and various west coast ports. In 1948 she was camera ship photographing the sinking of cruiser SALT LAKE CITY some 130 miles off the west coast. In the spring of 1955, she accompanied submarines TUNNY (SSG 282), CARBONERO (SS 339) and CUSK (SS 348) to Pearl Harbor and acted as observer ship and advance base headquarters during the first firing of operational missiles from submarines. In November 1960, HALIBUT (SSGN 587) came alongside NEREUS, the first nuclear submarine to be serviced by a tender on the west coast. The following year she ministered to fleet ballistic missile (Polaris) submarine THEODORE ROOSEVELT (SSBN 600). In the fall of 1964, NEREUS provided underwater support for the operational evaluation of the ASROC weapons system. Two years later her versatility in servicing SHIELDS (DD 596) won her praise from ComSubPac, and the destroyer’s captain. NEREUS entered the U.S. Naval Shipyard at Mare Island, Vallejo, Calif. 1 November for overhaul until 7 April 1967. Following refresher training she reported to ComSubFlot 1 for duty 11 May. That month she visited Acapulco, Mexico and became flagship for ComSubFlot 1 and ComSubRon 5. In the fall of 1967, UNIVAC 1500 data processing equipment was installed to speed the tender operations. Into 1970 the tender served the submarines of the Pacific Fleet keeping them at peak readiness. USS NEREUS was decommissioned in 1971. 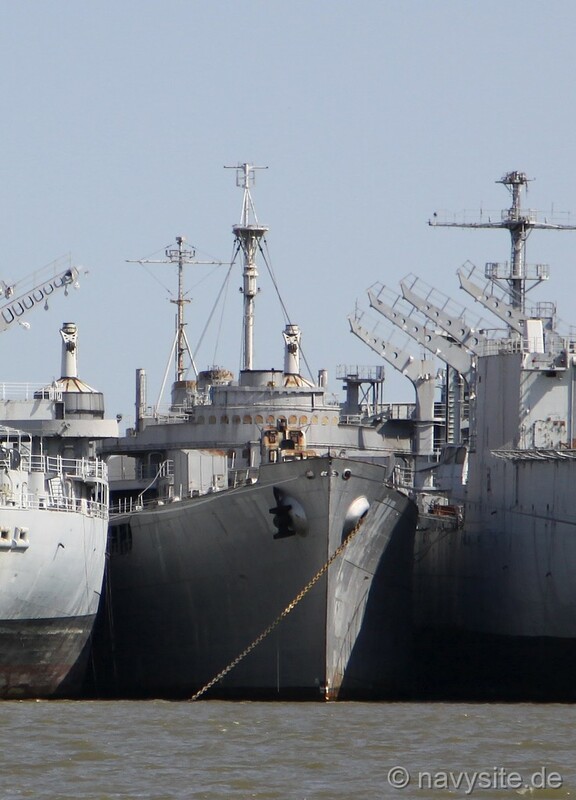 The photos below were taken by me and show the NEREUS laid-up at Suisun Bay, Calif., on March 27, 2010.